My Son is bodybuilder, he loves ENDURE Performance Electrolyte. Gives him energy, lots of Magnesium in it,. So it helps for dehydrating. The Price is a little High. ENDURE Performance Electrolyte – 4 fl. oz (118 ml) from Trace Minerals Research® may just be the right choice of electrolyte concentrate that helps improve your energy and stamina for enhanced physical activity. The electrolyte concentrate from Trace Minerals Research® may be mixed with any liquid for hydration. The concentrate contains potassium‚ magnesium‚ sodium‚ sulfate and chloride. The combination of these minerals may help in better hydration‚ more energy‚ reduction in muscular cramps. Magnesium may enhance muscular relaxation and may help in nerve impulse conduction that may prevent fatigue during physical activity. Potassium and sodium may support muscular contraction. Chloride may support the exchange of active oxygen between the cells. The concentrate does not contain carbs‚ calories or sugars. The electrolytes may help in cleaning up the toxic materials from the body after strenuous physical workouts. Re-energize your body and boost stamina with ENDURE Performance Electrolyte – 4 fl. oz (118 ml) from Trace Minerals Research®. Other Ingredients: Seawater‚ ionic trace minerals (ITM)‚ purified water‚ Non-GMO citric acid. Gluten-Free / Vegan / Vegetarian / Non-GMO / cGMP. Add 48 drops (1/2 teaspoon) to 32 z. of water (12 drops per 8 oz. ; 2 teaspoon per gallon) and shake well. I ordered this ENDURE Performance Electrolyte by Trace Minerals Research product from PureFormulas as I get dehydrated fairly quickly during my two hour workouts and it is the only thing that works! I don't get muscle cramps anymore neither since I've been using it! Makes my regular water taste like coconut water. The source of magnesium helps with dehydration. It reduces muscle cramps. A bit pricey, but not entirely unreasonable. My electrolytes were low, partially because I quit salting my food. 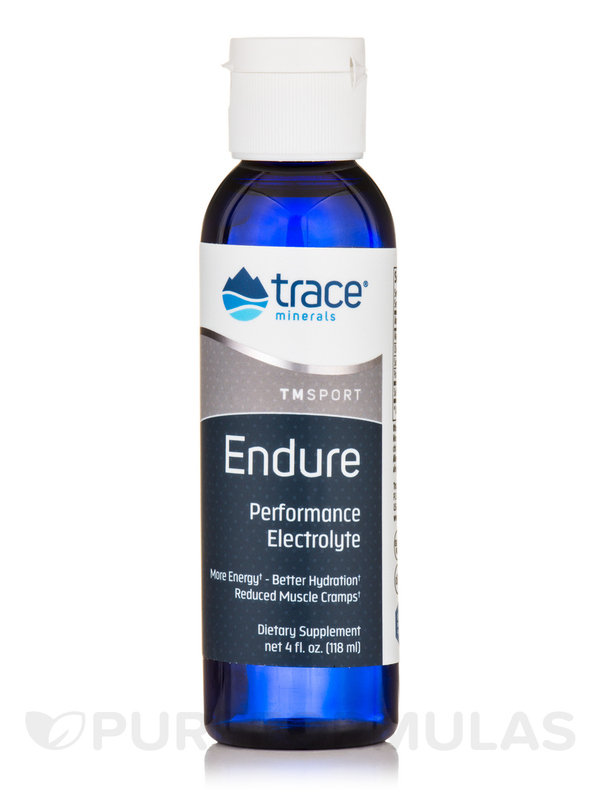 I need Endure Performance Electrolyte by Trace Minerals Research to help replace lost electrolytes. I originally purchased ENDURE Performance Electrolyte in a trial-and-error effort to find something better than the sweet ineffective power drinks that are commonplace.Great for replenishing de-hydrated conditions and Im sure it will be even better as a preventative measure. I previously purchased the smaller size but after giving it a try realized it worked for diminishing and then eliminating muscle cramps so I bought the larger. If its more than you immediately need (and it will be) put it on the shelf for future usage. is the 4oz container a dropper-style (like the 1oz)? the cap looks different, and I use a very small amount, 10 drops, several times a day. Hi Heather, thank you for choosing Pureformulas. The 4 oz bottle does not have the same dropper unit as the 1 oz bottle. Hope this helps. Have a happy and healthy day!